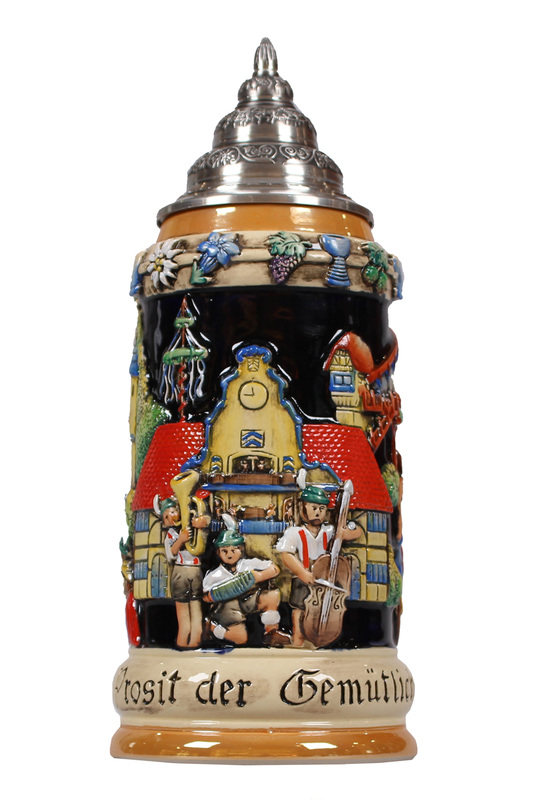 Handpainted 0,5l German Beer Stein Oktoberfest with solid pewter lid. Limited Edition of 10000 pieces. KING WORKS are situated in the Westerwald (Western Forest) of Germany, near the Rhine and Koblenz (the ancient Roman town of Confluentia) as well as the famous Limes (the fortified Roman border). In the very first centuries after Christ, you will perhaps find the oldest roots of potters' tradition in the area. Backed by generations of experience in finest craftmanship, KING-Steins are mostly based on designs of antique originals. The KING-Collection of Old German, Bavarian, Austrian and Tyrolian Steins, Tankards and Mugs offers you a choice of the most original and skillfully designed products available. The trademark KING guarantees the most authentic quality to all friends of genuinely handcrafted and handpainted German Steins.